Not all gladiators entered into the arena with limited armor and a weapon in hand. Some, like the secutor gladiator, would have worn heavy armor like this Gladiator Front and Back Plate, all with the intention of making the fight more entertaining. Unlike a typical breast plate and back plate combination, these pieces of gladiator armor were designed to be simple. This combination of front and back plate consists of little more than two plates of metal that are worn over the gladiators shoulders, providing protection to both the front and the back of the gladiators torso. After all, the objective of armoring a gladiator was not to make them unbeatable or defensibly invulnerable, but to prolong the fight, thus making it more interesting and more entertaining. This gladiator armor is made from attractively polished brass, which ensures that it gleams in the light. 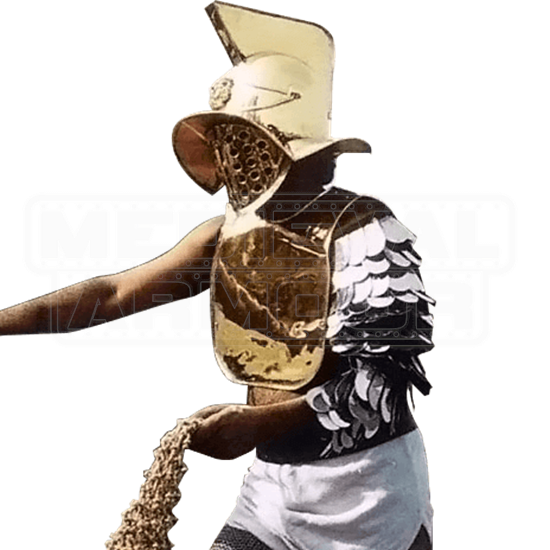 Imagine the effect that this Gladiator Front and Back Plate had on both the crowd and its opponent when it entered into the arena. Whether you are just looking at this armor or wearing it, you can almost hear the roar of the crowd as they hunger for what they know will be a good fight.